ตู้โลหะ “CAN” DB4 กว้าง(440) x สูง(610) x ลึก(120) มม. BiDi 1.25 Gbps, 1490 nm, Distance 120 km. SFP 4.25 Gbps SFP, 1310 nm, Distance 5 km. ตู้ Ritto (EUR 3) ฝาทึบ มีหลังคา กว้าง(300) x สูง(320) x ลึก(150) มม. CWDM 1.25 Gbps, 1470nm~1610nm for CWDM, Distance 80 km. ตู้โลหะ “CAN” DB2 กว้าง(350) x สูง(520) x ลึก(120) มม. 10G Transceiver SFP+ SMF 1310 nm, Distance 10 km. 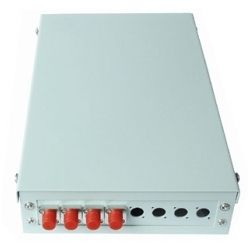 CWDM SFP+ 10 Gbps, 1270 nm - 1610 nm for CWDM, Distance 10 km. Model: OTB-A08 is a metal terminal box, with 8 ports for wall mounted using. 6 port, 12ports can be done as your request. Non-sealed type, fixed by bolt. Different adapter can be installed: FC, SC, ST, LC ect.